The Amish Bent Feather Stationary Bar Stool not only saves space around your high counter top, it will also enhance every occasion with its charming appeal. Pull one up for coffee in the morning, or visit with the kids after school over a snack. Influenced by the design of a Windsor chair, these solid wood bar stools give off an air of timelessness that will make for effortless decorating in your home. This Bent Feather Windsor Bar Stool is fine colonial American furniture, featuring a graceful and refined design. With bent feather shaped spindle work and turned legs that attract they eye, these wood bar stools contribute easily to your colonial style. Bring home the Bent Feather that suits your style best. 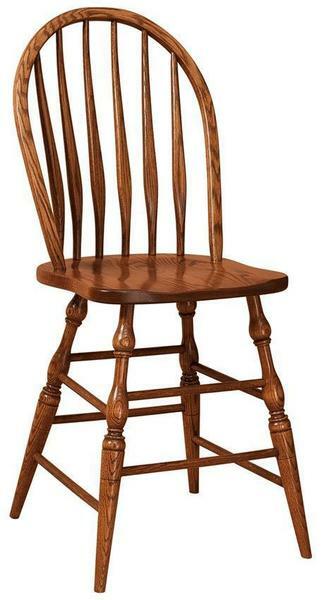 Nine wood options are offered for this Windsor chair with rustic woods offering a natural, organic character. Pick the stain that best fits your home decor and consider a fabric or leather seat. Pick the height you need for your kitchen, game room or crafting room with a 24" or 30" height available. Select the perfect natural seating option for your home furniture collection. These solid wood bar stools are sure to bring family and friends to your counter quite often! Don't miss our Amish Bent Feather Swivel Bar Stool that is both fun and functional. With any questions you may have, please do not hesitate to give us a ring at 866-272-6773 to discuss all of your options. The chairs arrived at or around the anticipated date and they look lovely. We are quite pleased with the workmanship. I would be happy to recommend DutchCrafters based on this experience.